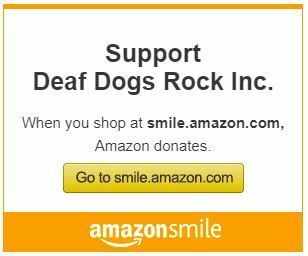 Thank you for contacting Deaf Dogs Rock to request a deaf dog listing! This is the first critical step in finding a loving home for a deaf dog in need. In the sections below you will provide information that is essential for giving a dog the best chance at a forever home. Please be complete and accurate, do not guess. If you do not know the answer to a question then please wait to complete the listing request until you can find that information. We cannot accept second party listings. You must be either the owner/foster, or an employee/volunteer of the shelter/rescue that is caring for the dog. Do not submit these requests on the behalf of others. To stay true to our mission and focus, we can only list deaf dogs. We cannot accept listings for deaf and blind dogs, or hearing dogs. This is the main body of the dog listing. Describe the dog carefully - physical characteristics, behavior, and background. Is there a certain type of adoption family you're looking for? Make this appealing to a perspective owner. Do not say "we don't have deaf dog experience so cannot work with this dog". No experience with deaf dogs is ever required, the adopter just needs a willingness to learn. Do not use scary statements like "this dog will be dead in 24 hours", we've found it simply does not help, and many people will not share the post if they think the dog is a lost cause. This writing should match the conversation you'd have with a perspective buyer, helping them confirm that this is the right dog to join their family. It is important that all of the following physical information be completed accurately and completely. Estimate to the best of your ability. Provide information as to where the dog currently resides, and accurate contact information to be used by interested adopters. Check box if the dog is listed on a site like PetFinder, or a shelter page. Check box if there is an online application available for this dog. To the best of your ability, provide short answers to the following important questions. Please type "unknown" if you do not know. This is the single most important section to the success of this dog listing. Individual photos only, no collages! You will upload a primary featured image, and up to three additional images are strongly encouraged. Take your time and get a good photograph! Photo should be clear, not blurry. Listings with blurry photos will not be posted. Photo should be a frontal view, clearly showing the dog's face. A good photo is the single best indicator of a dog's listing be successful. This image MUST be a frontal view, clearly showing the dog's face! Please upload up to three additional images. Good pictures get good homes for dogs! Thank you for caring for this dog! Use the button below to submit your listing. Submitted listings stay in draft mode until reviewed by Deaf Dogs Rock. Your listing should be live on the site with 24 hours. If we have questions or need more information, we will email the contact you provided above. I agree to contact Deaf Dogs Rock immediately if this dog is adopted or no longer available so the listing can be removed. ALLOW FORM TO PROCESS AFTER PRESSING SUBMIT. It may take a minute or two to process images, please do not refresh or exit the page until you see confirmation. Thank you!